LASIK is an incredibly safe and effective procedure used to correct myopia (nearsightedness), hyperopia (farsightedness), and astigmatism (irregular cornea shape). 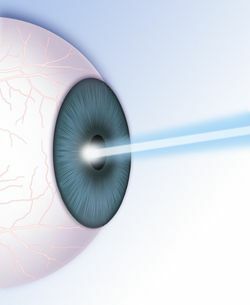 Since its introduction, advances in technology have improved outcomes and allowed doctors to perform completely bladeless LASIK. By turning to Dr. Thomas Byrd for bladeless LASIK surgery at his Detroit, MI-area practice, you can experience a lifetime of clear vision after a single brief procedure. To schedule a LASIK consultation, contact Byrd Eye Clinic today. In order to qualify for LASIK, you should be at least 18 years of age, in good overall health, and maintaining stable vision for at least one year prior to the procedure. On the day of your LASIK procedure, Dr. Byrd will numb your eyes using topical anesthetic eye drops. Next, he will utilize a Ziemer FEMTO LDV™ femtosecond laser (bladeless LASIK) to create a circular flap of corneal tissue in each eye and reveal the underlying stroma, or middle section of the cornea. To complete the procedure, Dr. Byrd will use our VISX STAR S4™ excimer laser to adjust your corneal shape and correct refractive errors before replacing the corneal flaps, where they will heal without the need for stitches. This entire procedure can often be completed in less than 30 minutes. In most cases, patients will notice an immediate improvement in the clarity and quality of their eyesight after surgery. When you return home, you should spend the rest of the day resting your eyes and avoiding strenuous activities. Dr. Byrd will see you the day after your procedure to monitor your healing. You should be able to resume work, school, and other regular activities within one to two days. To ensure your eyesight is improving properly, you will return to our office after six weeks, and then again at the three to four month mark, with a final check-up one year from your surgery. In many cases, patients achieve 20/20 eyesight or better after recovering from LASIK. Dr. Thomas Byrd has been at the forefront of laser vision correction surgeries for more than 25 years, and he served as co-investigator for a Food and Drug Administration (FDA) study on the efficacy of the VISX laser. Additionally, Dr. Byrd also earned what is widely considered to be the finest cornea fellowship in the world by undergoing a rigorous two-year program at the LSU Eye Center in New Orleans, where he trained under internationally renowned corneal and refractive surgery pioneers Drs. Herbert E. Kaufman and Maguerite McDonald. Dr. Byrd soon went on to serve as the Director of Cornea Service at the Henry Ford Health System, teaching cornea and refractive surgery to residents and credentialing on-staff surgeons. This extensive training and experience has made Dr. Byrd one of the most well-qualified LASIK doctors in America. By turning to Dr. Byrd for LASIK surgery, you can reduce or completely eliminate your dependence on corrective lenses. To learn more about the cost of LASIK, and how the procedure can dramatically improve your vision, please reach out to our practice today to schedule an appointment and learn more.